I recently had one o' those fortuitous 'blind pig finds a truffle' moments in the shape of an older SloJoe picklock in really nice condition. 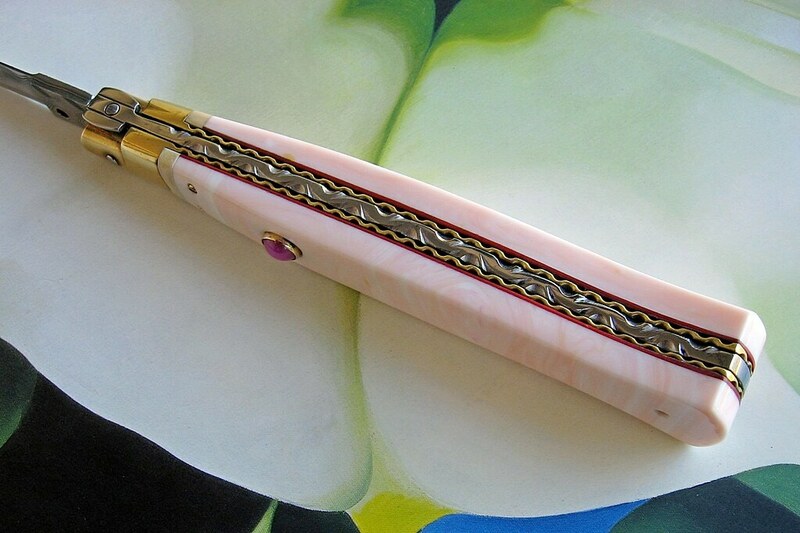 It has a polished Swedish Damascus blade, pink conch shell scales with mammoth(?) 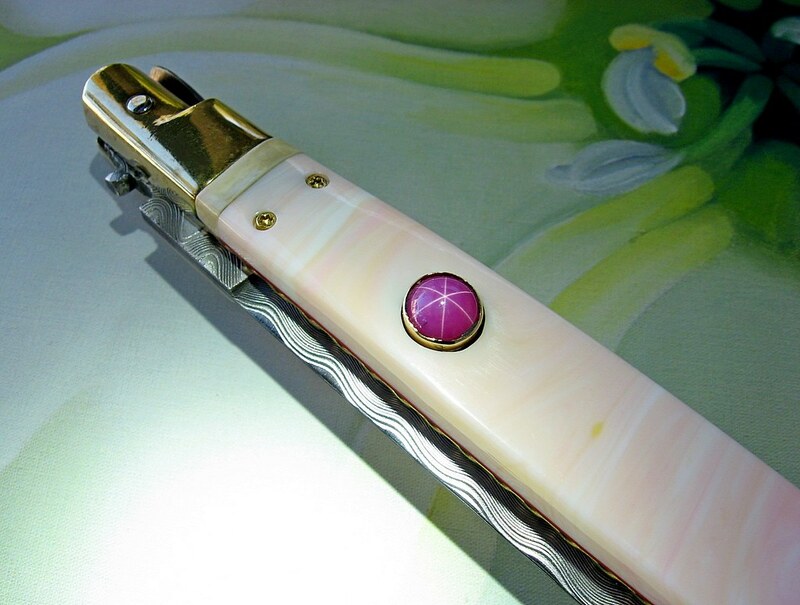 ivory spacers and red liners, vine and thorn filework all around, gold screws, and a lilac star sapphire button set in a 14k gold bezel. 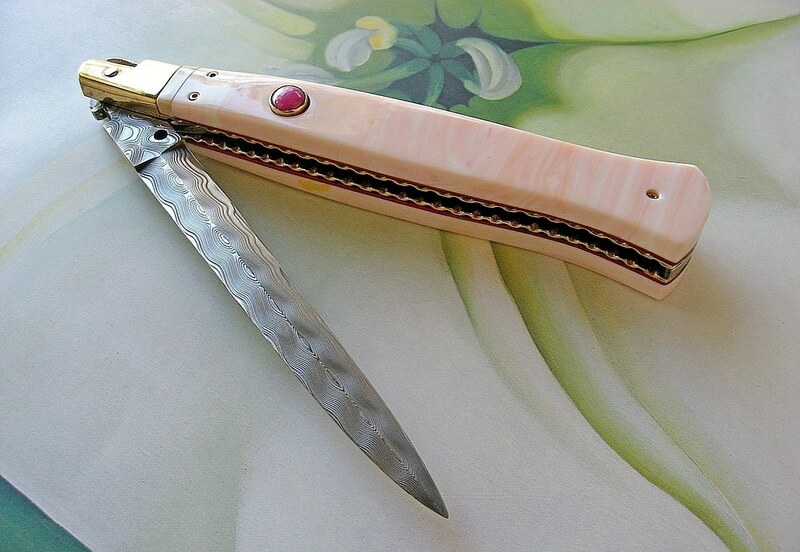 I know that this is a customized, rather than custom, knife but I'd love to know what it started its life as. 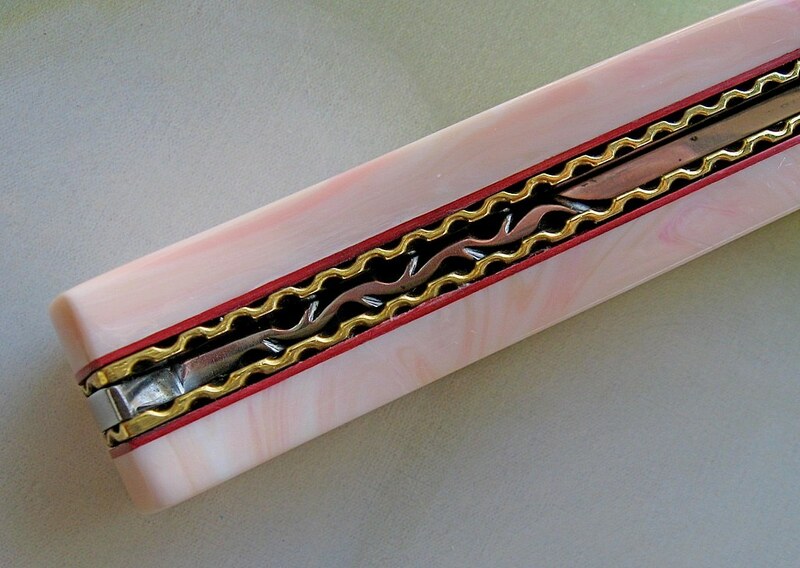 The brass bolster looks like your standard picklock job with the guards ground off, but if so, he/they did a seamless job on it. 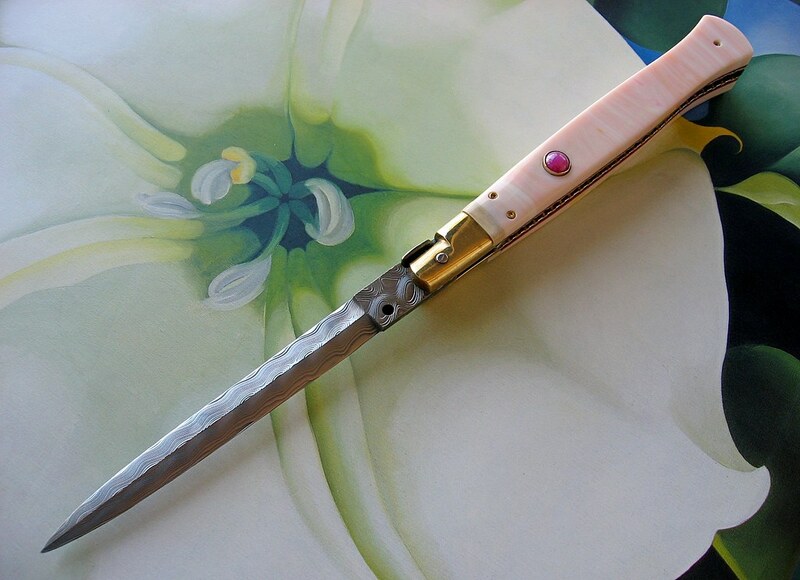 The blade is well-ground with good symmetry, a nice 3D etch, and a bright polish. Any idea who made it? The backspring w/lock tab, kick spring, and liners were obviously standard issue parts before Arlin and his files worked their magic on 'em. Last edited by Corvus on Mon Dec 31, 2018 3:35 am, edited 2 times in total. It's truly a work of art, nice score! I don't think that is a SloJo customized production knife. I think it is a George Cameron custom (all original). That blade sure doesn't look like a production blade. And the bolsters are made from a solid piece of brass. if it was an existing bolster with the guards chopped off there would be holes on the side. Also, I think those red liners are something only GC does. It is weird that he didn't stamp it, though. Maybe he was using the really hard Damascus that wouldn't stamp well. Really nice. Love the dagger grind. As noted, I haven't a clue as to the source of the parts. The shape and proportions of the bolsters are pretty much identical to the standard fare except for the lack of guards. If anyone knows where they came from, I'm all ears. I can certainly see why you'd equate the two. They're superficially similar, but the build details are very different. For starters, look at their respective backsprings. 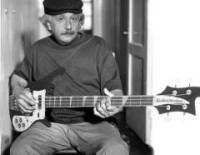 That's a true custom with no obvious stock parts in evidence, unlike mine. Last edited by Corvus on Fri Oct 12, 2018 1:31 am, edited 1 time in total. 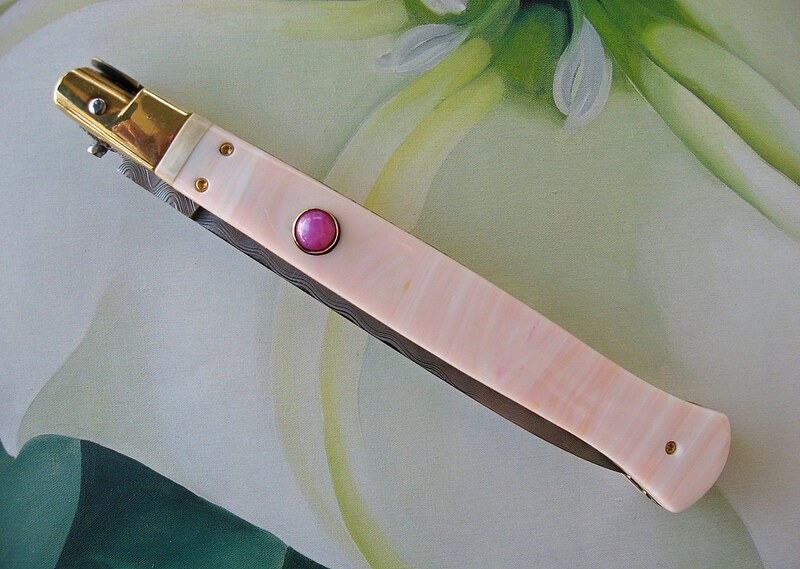 Actually, now that I look at it some more, I think it might be a SloJo customizing of a George Cameron knife. The gold & filework are a little more garish than Cameron's normal stuff so I think it was customized by someone else, most likely SJ. LMAO - We both posted the same link to the same knife at the same time. You're right; that is a production backspring. It might just be a SloJo that happens to look a lot like a GC (I think GC always uses steel liners). I see SJ has a few other knives that are very similar to the GC one. I would guess the backspring is from a good Italian 11" (I wouldn't worry about it's quality). I think the Damascus blade was made for that knife. Though, it is kind of weird to make a blade for a knife, but then use the backspring from another knife. Every "mangler" builds knives like this. The front bolster shape is common-and very easy to do. 11In. Italians were available with damascus blades. Fake conch shell (too short, BTW) and gold screws are readily available. It could be one of Arlin's-or it could be one of at least a dozen other customizers. You could send him a picture and ask him. Bill DeShivs wrote: Every "mangler" builds knives like this. The front bolster shape is common-and very easy to do. 11In. Italians were available with damascus blades. Fake conch shell (too short, BTW) and gold screws are readily available. It could be one of Arlin's-or it could be one of at least a dozen other customizers. Thanks for the info, Bill. 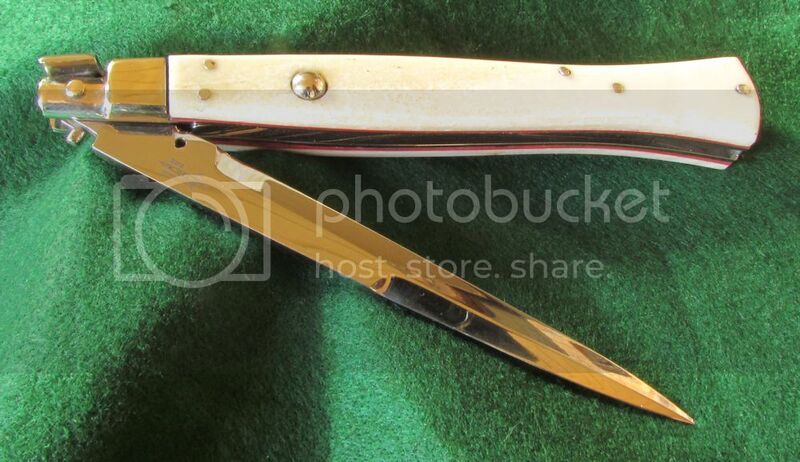 As noted (see the link in my post above) this particular knife is shown in the archives on Arlin's site. That knife was made by Arlin not me. All my blades are hand ground and all back springs are 3/16 thick. Also I rarely do file work. Only did a few on my early work. The only thing I did for that knife was tell me what I use for spacer and who I order it though.As to what Bill said he is right the front guards with no ears are fairly common with a lot of us knife makers. George, welcome to the board and thanks for the info. 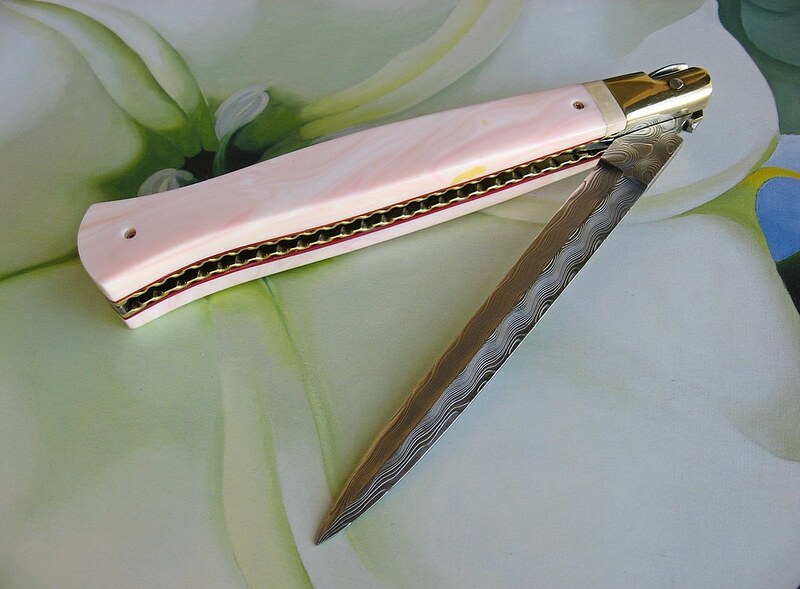 Do you (or anyone else) know of a production stiletto that uses those solid guard-less bolsters or are they only used by manglers and custom makers? Those are definitely handmade bolsters on your knife. It's a solid piece of brass soldered on the liner and then pivoted on a sander to get that shape. They all look uniform because that is just kind of the natural shape of guardless bolsters. Here is some solid ones I have that were all done with files and sanders.